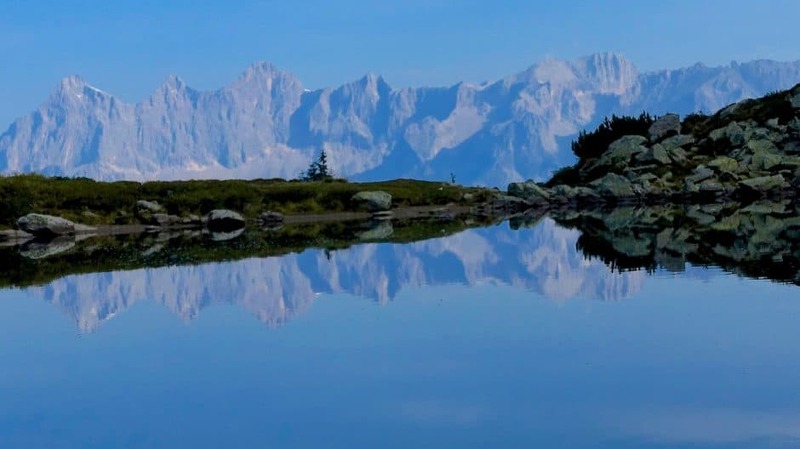 Officially it is called Medium Gasslsee, but more popular is this gem in the Schladminger Tauern under the name Mirror Lake. Because in clear view and little wind the legendary South walls of the roof Dachstein reflected in it. Particularly appealing, because of blooming alpine roses framed, this spectacle shows up from mid-June. On 1. Sunday in July the traditional feast for Almrausch Bloom takes place on the Reiteralm. But actually, the Mirror Lake has to be almost every season season. In early summer because of the already mentioned Almrausch bloom. In midsummer as a welcome cooling off after the sunny climb. In autumn, as a picturesque photo motif, the Goldgeben larches “burn” in the “Styrian Summer”. Due to its low depth, the mirror lake almost always has quite moderate water temperatures. If you want to swim in the lake, some plates at the south end are available for entry and as a photo platform. 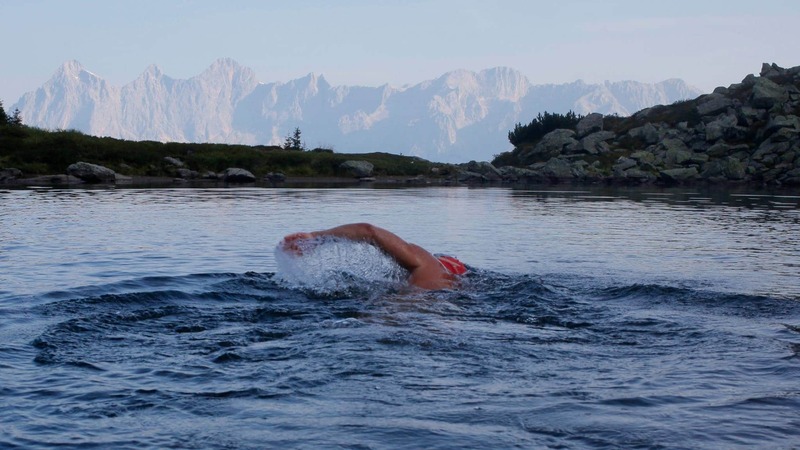 From there you can swim straight into the rugged dachstein south walls. 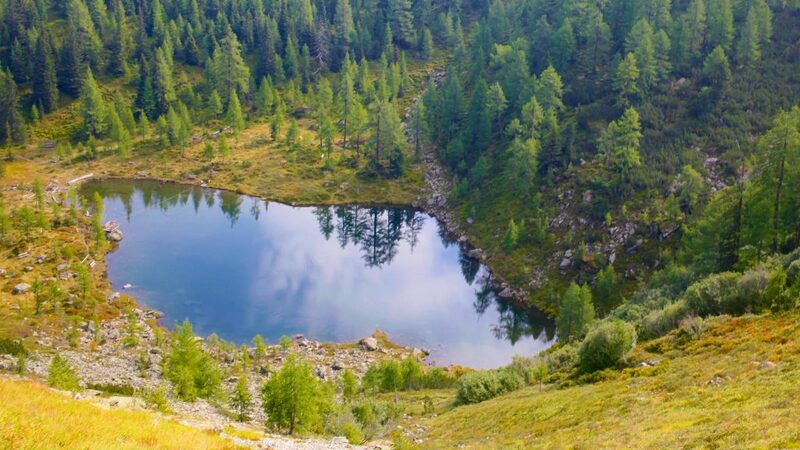 The lake can be explored by a simple and relatively short climb of CA 1700 bis1900m on a pretty well-laid hiking trail. If you drauflegt a few meters of altitude, you can climb one floor higher up to the upper Gasslsee. This little Eiszeitsee is situated in the back kar at the foot of Rippetegg and Schober. From here, the view overlooks the Dachstein and the bishop’s cap and far into the ennstal. Seen in this way, this trip goes even as a relatively simple 3-lake hike along and to the three Gasslseen. Through the Ennstal to the Valley station of the Preunegg-jet of the Reiteralm Mountain Railways. Either parking and driveway with the 8-cable car (every Tuesday and Friday from the middle of June to the beginning of October) or via the toll road (approx. 3.50 Euro per person) to the Gasslhöhe. From the mountain station Preunegg-jet or The parking lot at the Gasselhöh Hut is followed by the route No. 66. After you have circled the reservoir, you win at the eastern slope along the height. Shortly thereafter, the steep downhill path leading to the lower Gasslsee (untersee) branches off to the left. Only a short steep piece then one stands after about a quarter of an hour on the shore of the Mirror Lake and does not come out of amazement. As a variant, the two-hour hike over the Reiteralm Mountain Trail (via Rippetegg and Gasselhöhe) is an option for the way back. Or you can follow the first half of the usual way of marking No. 66a and takes half an hour in addition to the untersee before returning to the starting point.